Constructed: Late 12th century C.E. Best time for visit: Anytime. 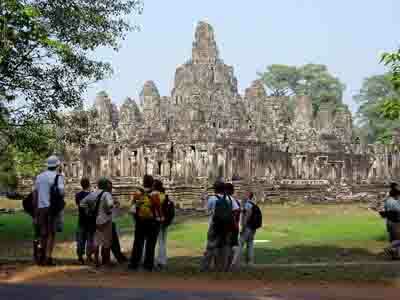 Be aware that most tourists go to Bayon in the morning. The temple is nearly empty in the afternoon, so you won't be disturbed by other tourist groups. If you see only two temples, Angkor Wat and Bayon should be the ones. The giant stone faces of Bayon have become one of the most recognizable images connected to classic Khmer art and architecture. There are 37 standing towers, most but not all sporting four carved faces oriented toward the cardinal points. Mahayana Buddhism's compassionate Boddhisatva, or perhaps a combination of Buddha and Jayavarman VII. It appears to be, and is to some degree, an architectural muddle, in part because it was constructed in a somewhat piecemeal fashion for over a century. The best of Bayon are the bas-reliefs on the exterior walls of the lower level where the stone faces reside. The bas-reliefs on the southern wall contain real-life scenes from the historical sea-battle between the Khmer and the Cham. It is not clear whether this represents the Cham invasion of 1177 AD or a later battle in which the Khmer were victorious. Even more interesting are extensive carvings of unique and revealing scenes of everyday life that are interspersed among the battle scenes, including market scenes, cockfighting, chess games and childbirth. Also note the unfinished carvings on other walls, likely indicating the death of Jayavarman VII and the subsequent end of his building campaign. Some of the reliefs on the inner walls were carved at a later date under the Hindu king Jayavarman VIII. The surrounding tall jungle make Bayon a bit dark and flat for photographs near sunrise and sunset.